Lake Kivu is extraordinarily beautiful: a vast inland sea enclosed by the steep, green terraced hills that are so characteristic of rural Rwanda. Along its shores lie three resort towns, Gisenyi, Kibuye and Cyangugu, connected by a wild roller-coaster road that tumbles through lush plantain fields and relic patches of misty rainforest to offer sweeping views over the shimmering lake. Gisenyi, a short drive from Ruhgengeri and the Parc des Volcans, is set on a sandy beach lined with swaying palms and colonial-era hotels that positively exude an atmosphere of tropical languor. At Kibuye, tourist activities are centered around a modern lakeshore guesthouse, which overlooks pine-covered hills seemingly transplanted from the Alps. Different again is Cyangugu, close to Nyungwe Forest, where most subdued tourist development is compensated for by perhaps by the most spectacular setting of them all. Lake Kivu is the largest of numerous lakeswhich fill the valleys of Rwanda. Lakes Burera and Ruhondo, close to the gorilla-tracking centre of Ruhengeri, are often neglected gems: deep blue waters ringed by steep hills and tall waterfalls, with the outlines of the nearby Virunga Volcanoes providing a spectacular backdrop, particular as seen from the comfortable Foyer de Charité guesthouse on lake Ruhondo. Further south, Lake Muhazi makes for a good day trip from Kigali, with overnight camping available. Gisenyi and Kibuye are the places to head for creature comforts and water sports. Away from the main resorts, however, the lake circuits offer rewarding glimpses into a more ancient Africa, as fisherman ply the water in dugout canoes unchanged in design for many centuries, colourfully dressed ladies smoke traditional wooden pipes, and troubadours strum sweetly on stringed iningire (traditional guitars). The bird life around the lakes is fantastic: flotillas of pelicans, majestic crowned cranes, jewel-like malachite kingfishers, and much else besides. Overnight at Buhoma Community Campground. 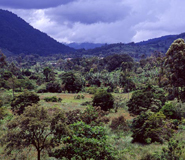 The Buhoma Community Campground is located in the Bwindi Impenetrable National Park in Buhoma, home to the endangered mountain gorillas. 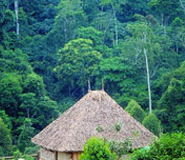 You will have a close encounter with the mountain gorillas and visit the batwa community villages in Buhoma situated in the Northern sector of Bwindi impenetrable forest national park. 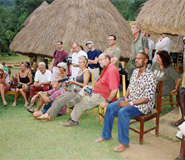 Visit the traditional healer, the local brewing site, the Batwa homestead and end our day by enjoying entertainment from the locals as they sing praise to the conservation of the mountain gorillas. More still take part in traditional meal preparation and competitions, learn to prepare traditional meals and the techniques of cooking as well as teaching local people modern ways to prepare meals in your country. This journey is long; Whole day driving.If we arrive early; take lecture on the old traditions of the inhabitants as we visit the museum at the camp.Bunyaruguru is world over famous for its cup-shaped craters that resulted due to volcanic activity during the ploecetein era; however, the indigenous people believe in some cultural occurrences that might have led to the formation of these craters. 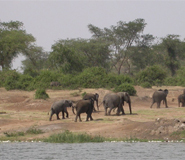 Game drive in the Park and Boat ride at Kazinga Channel.Queen Elizabeth National Park is one of the most diverse ecosystems in Africa. The open savannah dotted with Acacia and Euphorbia trees provide habitat for elephants, lions, leopards, Uganda Kobs and big herds of buffaloes. Ten primate species including chimpanzees are present. Gorilla Nest Lodge is Positioned on the foothills of the Virunga Volcano range this beautiful lodge provides breathtaking views of Rwandan hills and the slopes of the Volcanoes National Park. Situated in Northern Rwanda’s Musanze district, Gorilla’s Nest Lodge is nestled in a forest of Eucalyptus trees. 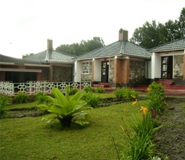 Kinigi Guest House is a comfortable base to the panoramic commanding beauty of the volcanic mountain ranges of Virunga, the natural habitat of the rare mountain gorillas. It is situated at the bottom of Sabyinyo volcanic mountain. 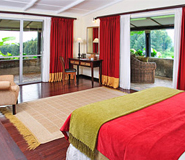 Our Safari Lodges are selected by our travel Manager, who makes sure the safari lodges we select are up to par. They help us get the best accommodation rates at the best safari lodges so we can, in turn, offer them to you.